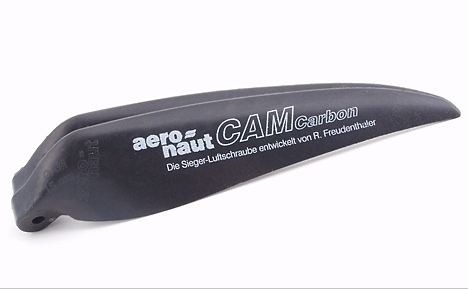 aero-naut Cam Carbon Blades, 11 x 8, 8mm blade root width, sold as a pair. This new generation of folding propellers from Rudolf Freudenthaler, are designed using CAD-CAM technology. The very thin, carefully optimized blade shape and computer-calculated airfoil sections guarantee very high accuracy and excellent efficiency combined with low power absorption from the electric motor. All blades are made exclusively from a mixture of carbon fibres and nylon, which has proved excellent in our propellers over many years, as it endows the blades with very high torsional rigidity. These blades are very light in weight thanks to the extremely thin blade profile and the materials employed.